We love skillet meals around the Chase household. They’re hearty, filling, and super quick (and mindless!) to prepare on busy weeknights. While many of my favorite skillet meals are made all in the same skillet, this one the pasta is cooked separately and tossed in after the meat-tomato-cream sauce is prepared. This recipe is easy to adapt – you could sub jarred marinara for the diced tomatoes and tomato paste. You could sub cream cheese or whole milk for the cream (although cream is best, IMO!). You can dial up or down the garlic and onions. But the 1 lb. meat to 12 oz. pasta combo is quite perfect – so stick with that and adjust for servings sizes, as needed. 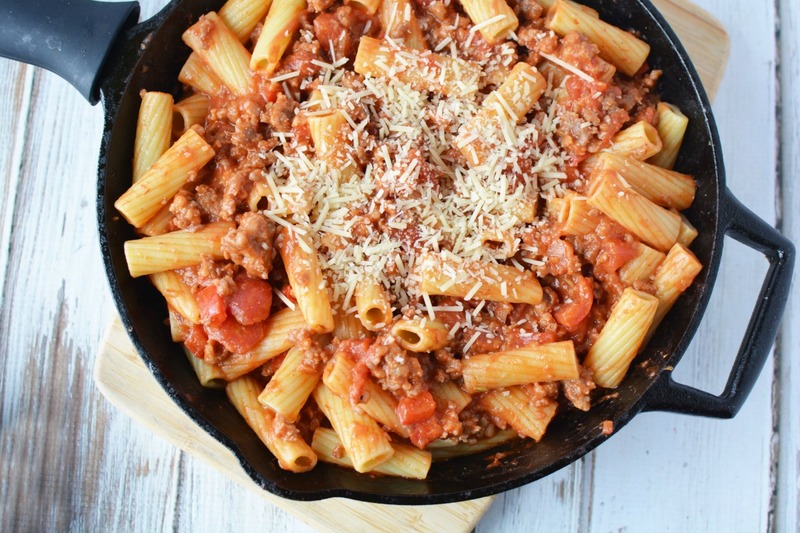 And with that, the recipe……..
Cook the rigatoni pasta, as directed. Seed and chop the red bell pepper. In a large skillet, brown the ground Italian sausage (if needed, casing removed) with the chopped red bell pepper, minced onion and garlic powder. Once browned, drain and then mix in the diced tomatoes and tomato paste until thick meaty-tomato sauce forms, then stir in the heavy cream. Let simmer for a few minutes to allow flavors to mingle. Toss the cooked pasta with the meat sauce and garnish with grated Parmesan cheese. Serve Skillet Rigatoni with Sausage with side salad.